Learn which groups and commands are found on which tabs. Home. The Home tab includes commands for formatting worksheets, cells and data and commands for inserting and deleting columns and rows. Insert. Use the Insert tab to insert tables, illustrations, charts, links, sparklines, headers & footers, custom text and symbols, and more. Page Layout. Use the Page Layout tab to change your margins, change the page background, change the page orientation, and more. Formulas. Use the Formulas tab to browse and select formulas and functions, to define names, to audit formulas, and more. Data. Use the Data tab to access external data, to sort & filter, to access data tools, to group cells together, to add subtotals, and more. Review. Use the Review tab to check spelling, add comments, protect your worksheet or workbook, and more. View. Use the View tab to change your workbook view, show or hide gridlines, headings, the formula bar and the ruler, arrange windows, freeze panes, zoom in or out, and more. Help. Use the Help tab to use online help, send feedback, and access community resources. Add-Ins. You may or may not see the Add-Ins tab. This tab shows up after you install and activate your first Add-In. Add-Ins are beyond the scope of this course. Note that the File menu is not the same as a tab. The File menu takes you to the Backstage view, where you manage, rather than make changes to, your workbook. The Backstage view is covered in the next lesson. The group options may differ slightly if you are using previous versions of Excel. 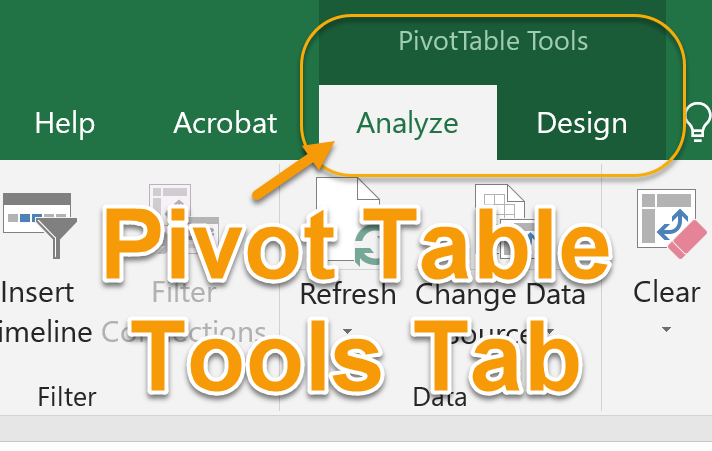 Excel 2016 and 2019 provide some new groups, including Insert > Add-ins and Tours, Data > Get & Transform and Forecast, and Review > Insights .. 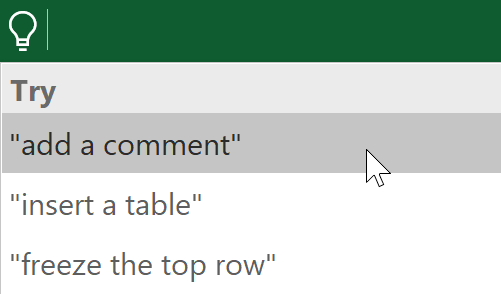 In Excel 2016 and 2019, the Ribbon contains the text "Tell me what you want to do..."
If you click this text, it becomes a text box where you can enter text to search on to quickly perform actions. Just clicking the box pops up some possible ideas. For example, "Add a comment" brings up a comment in the cell the cursor is in. Commands are controls that enable you to accomplish specific tasks, such as bolding a word, wrapping text, changing the format of a number to percent, or adding a column. How many tabs are there? How many groups are there on the View tab? Which tab contains the most commonly used groups and commands? What is another name for the File menu? On what tabs and groups are the following commands found? If your installation of Microsoft Excel has been customized, some of your answers may differ.